Helicobacter pylori is associated with a variety of gastrointestinal diseases including non-ulcer dyspepsia, duodenal and gastric ulcers and active, chronic gastritis. H. pylori is known to be a major cause of gastric ulcers (90% of duodenal and 80% of gastric ulcers) which double a person’s risk for developing gastric cancer. 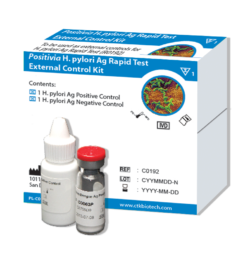 H. pylori infection is currently detected by invasive testing methods based on endoscopy and biopsy (i.e. histology, culture) or non-invasive testing methods such as the urea breath test (UBT), serologic antibody test and stool antigen test. 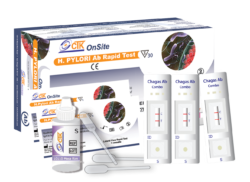 Serologic antibody tests serve as initial screening tests for H. pylori infection. 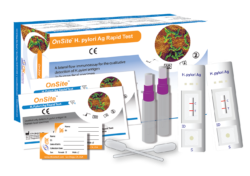 The stool antigen test detects antigen present in the feces which indicates an active H. pylori infection. It can also be used to monitor the effectiveness of treatment and the recurrence of an infection.